Just like any other Thai town, Udon Thani is crammed with places to eat. From simple roadside or market stalls, through to air-conditioned restaurants and hotel or mall outlets, Udon Thani eateries cater to every price range and encompass, beyond Thai food, the cuisines of countries such as Japan, Korea, Vietnam, the USA, France, the UK, Germany ...and even Denmark. The places we recommend below are for those looking for authentic dishes in a variety of styles and at various budget levels. We have chosen to highlight them for their consistency, popularity amongst locals, and strong review profiles. They are listed in no particular order. A simple, fan-cooled restaurant that specializes in northern Thai dishes, Khao Soi Tai is a popular place near Udon Thani airport. The northern Thai / Burmese style coconut curry is served in chicken and beef versions over soft yellow noodles and topped with crispy noodles. The dish is, as always, accompanied with fresh lime, pickled cabbage and hot chili flakes in oil. Diners can also order Hanglay curry, northern Thai sausages, and mixed appetizers with green chili dips. Young children will appreciate a plate of dim sum. 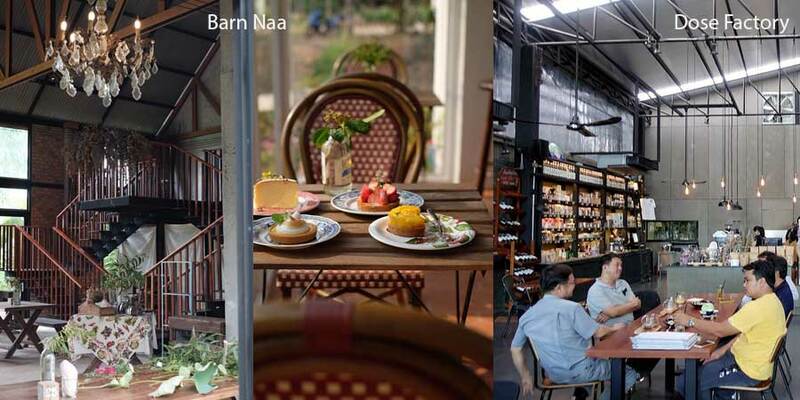 A fairly recent arrival in a hidden rice paddy location out of town, Barn Naa Cafe brings style and originality to the Udon Thani cafe and dining scene in unexpected ways. It comprises an architecturally interesting, high-ceiling dining hall housing the restaurant, and a neighboring building that is home to the coffee and cakes section. The restaurant serves local Thai favorites with a keen eye on presentation, and diners are advised to order several different dishes. Meanwhile, the cafe serves home-baked cakes and freshly ground coffees. Notably, the freshly-baked cakes and tarts here are a far cry from the industrialized, artificial cakes normally found in the region, but rather are genuine versions of cakes you would find in an upscale tea house in Europe or the USA. Choose from the display that includes favorites such as fresh fruit tarts, profiteroles, cheesecakes, and rich dark chocolate gateaux. Prices: The restaurant dishes are moderately priced, whilst the cakes are expensive for the region. However, the prices reflect the excellent quality of the bakery goods. Located on the ring road and adjacent to a large lake, this Thai restaurant is popular with Thai families and businessmen. It offers outdoor garden seating overlooking the lake, as well as indoor spaces. With a substantial menu, you will find most of the classic Thai and northeastern dishes on offer. The menu is clearly divided into sections for seafood, meats, spicy salads and more, and is also available in English. Best visited in the evening rather than for lunch. One of two outlets in Udon Thani, Dose offers freshly brewed coffees, and a selection of Thai noodle and curry dishes, as well as western dishes, including several versions of eggs benedict, Greek salads and steaks. They also run a coffee school for would-be baristas! A long-established Udon Thani restaurant on Nong Prachak lake, Rabieng Patchanee offers both indoor and outdoor seating and its focus is on Thai dishes. Dishes offered will satisfy both lovers of traditional Thai food and spicy curries and salads to those who prefer much milder fare. An English language menu is available. Finally, VT Naem Nuang is a Vietnamese restaurant in Udon Thani that not only has a large and loyal following, but has also expanded dramatically. It boasts a massive new headquarters in town and has numerous outlets selling boxed versions of their Vietnamese specialties across the province. Unfortunately, in our opinion, it has never matched or surpassed the Vietnamese offerings available in Bangkok or elsewhere, and as such is not included in our Top 5. For those who do not feel adventurous, or who for some reason crave the familiarity of brands, Udon Thani does also cater to this market. The town offers standalone, individual places to eat as well as a host of restaurant chain outlets, be these Thai chains such as S+P, MK Suki or Oishi, or international chains such as Pizza Hut, McDonalds, KFC, Burger King. Indeed, the upper restaurant floor in Central Complex, the largest shopping centre in town, is crammed with such chain outlets. What is noticeable there however is that there is a real preponderance of Japanese restaurants, some specializing in sushi and sashimi, others in BBQs and others still in Ramen and noodles: it is as if Japanese food is considered fashionable when eating out here. © Gecko Villa 2018. All rights reserved.